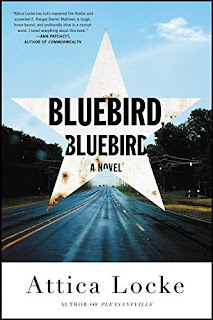 Recently I completed reading the book Bluebird, Bluebird by Attica Locke. The book, is a contemporary crime novel focused on a Texas Ranger, Darren Matthews, who with his own personal demons in the typical flawed hero fashion who finds himself involved solving a crime in a small East Texas town. Yet, this book is not just a crime novel, it's a social reflection. The author, Locke, an African-American has chosen to make her main character a Black Texas Ranger -- something she calls out as unique. This man, is being indicted in court at the start of the book for involvement in another crime and being accused of protecting a black man (a friend) who is accused with limited evidence of killing a racist white man who had given his friend (and the ranger) grief on previous occasion. 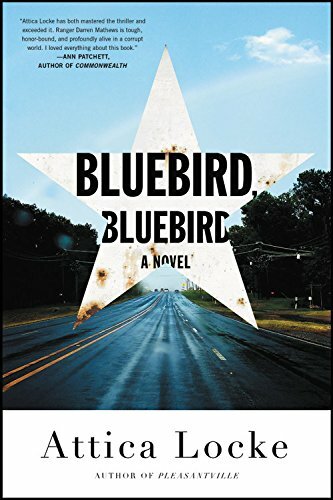 With his Texas Ranger status suspended he rolls into a situation where he's investigating a crime of a white woman and a black man (potentially connected) in a small town with a black diner and bar that may be part of a Aryan hate group. Oh, yes, and the small town's police force is, you guessed it, white and resistant to the rangers investigation. I've chosen the phrase "social reflection" instead of "social commentary" though here to describe this book. Locke was clearly working through fiction to create characters and situations that interacted with the public discourse on the state and perceptions of African American rights and relationship with police and the justice system. Yet at the same time she chose some archetype characters put didn't just want to tell a one-dimensional tale with a cut and dry message. Instead she layered in a deep complexity of roles, power, and the impact of time and culture. In many ways shaping a story that in many ways seemed to say "this is complicated." In many ways, one of the compelling parts of this story is that it takes place in small town Texas, and you can tell that Locke has done well to craft this landscape in a real and compelling way, that makes this story unique (and perhaps at time easier to contain) than a story that would take in an urban environment. In that regard, as a story, there were times when I felt like Locke was more concerned with weaving this reflection and layering of characters than in creating a compelling plot. There was certainly moments here that were engaging, but there was also a point when I found myself ready for some action but instead got backstory and reflection -- something I typically enjoy, but with a series of flawed characters and complexities I found myself start to at times find myself to emotionally detach from the characters themselves and find out how it all fit together. If there is one more critic here, it was that in many ways, there was something about this book that felt more like a film or television series. It may be unfair to assume that Locke's experience as a writer for the Televisions series show Empire would have influenced her writing here, but in a story like this I expected to see some more character arch in the central character, but instead Darren seemed like the star of a TV show with those around him coming in and out as support characters. In this way, it was not surprising to me to find out after reading it that FX had made purchased rights to Locke's work (this book to be the first of three) to be produced under the name Highway 57. I could see this doing well in this medium, and frankly in many ways I sensed it being written with this end game at least partially in mind. All in all thought, I appreciated this book and think that it's good to see these conversations as part of our social dialogue and appreciate what seemed to be an attempt to present a multi-faceted story that didn't try to hard to generalize the race/justice conversation into a single narrative. This book is part of my 12 books in 2018 challenge, see the other books/post here.